The University of Canberra has joined the list of Australian organisations dumping their legacy Windows XP environments and upgrading to Windows 7, completing a 900-seat rollout in August to its student PCs that also included an upgrade to Microsoft Office 2007. Like many organisations, the university skipped Vista, acting team leader for its managed operating environment Stephen Hurst said last week in an interview. The institution’s IT department was comfortable with Windows 7’s much-maligned predecessor, he said, but its end users had “a lot of reservations” about Vista. 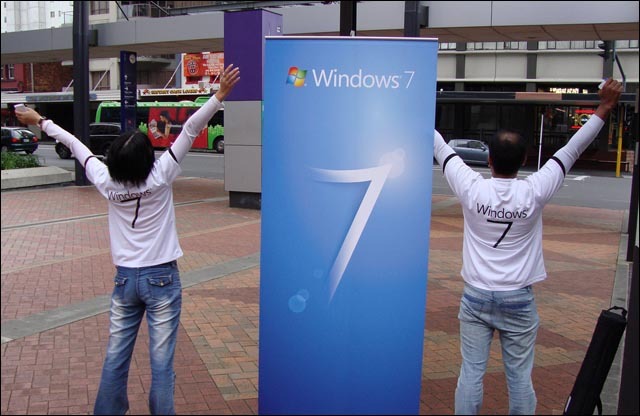 A number of Australian organisations have previously praised Microsoft’s own deployment tools for Windows 7 as being robust, but in the university’s case there were two tools which Hurst said were key to the success of the upgrade, which took place without any major headaches. The first tool is a piece of software called Deep Freeze by a company named Faronics. The technology keeps students’ machines in what Hurst describes as a “known state” — that is, similar to the way a Linux live CD works, the machines boot up returned back to their basic operating system. The second tool was a product called DistriBrute by Dutch firm 4M88. DistriBute uses peer to peer distribution technology to deploy software — Windows 7 and an associated bundle of applications, in the University of Canberra’s case. The initial DistriBrute server acts as a ‘seed’ — in BitTorrent technology — from which the PCs start pulling the Windows 7 desktop standard operating environment image. And then, when they have enough of the data, the PCs themselves act as servers to help distribute the software to each other. The deployment method is useful for other reasons as well — Hurst said if the machines need re-imaging in future, they already have the image on their hard disk drives from the initial process, so they don’t need to download it from the university’s network again. The University of Canberra only has a single campus. But DistriBrute could be additionally useful to institutions with more than one campus, said Hurst, because that campus’ PCs would not all need to download the image centrally as machines could share the file between themselves. UC went with the 64-bit version of Windows 7, although it had been using the 32-bit version of Windows XP. Hurst said the reason for the choice was that although most of the university’s machines only had 2GB of RAM, some specialised labs — for example, those where students learn video editing — had machines with 8GB of RAM which would need the 64-bit version to address completely. The university didn’t conduct a mass desktop hardware rollout along with its Windows 7 deployment, although some ageing machines were replaced as they had gone out of warranty. But Hurst said Windows 7 performed well on machines that were in warranty that had been running Windows XP, due to forethought. “We’ve been — probably for the past three years or so — been purchasing machines with an eye that they could be running either Vista or Windows 7,” he said. The rollout took place in August, just before students came back from holidays to start the semester. And while UC has about 130 applications in its SOE, Hurst said there were only a few pieces of the software that had problems with the upgrade, and those were fixed with upgrades as well as using Microsoft’s AppVee application virtualisation software. A few ageing scanners did have driver problems, however. Currently the university is investigating how it will upgrade its staff PC fleet to Windows 7, but it will likely use Microsoft’s own deployment tools for the rollout, as the nature of how staff use their machines is quite different than how students use theirs. Hurst notes, for example, that students can’t modify the PCs, which they only use on an ad-hoc basis, while select staff have administration rights on their machines. The news comes as a number of other organisations have recently migrated to Windows 7 or flagged plans to do so — for example, Toyota Australia, Brisbane Girls Grammar and St Leonard’s College in Victoria. Windows 7 is great. We are also deploying over 1000 machines including laptops and desktops at TEXAS A&M University, Qatar. We are not using any commercial product but only Microsoft’s deployment tools, i.e. MDT 2010, WAIK, DISM, etc.